Laurel is a charming and quiet town tucked away in the backwoods of Mississippi. My husband has been relatively close to here for work before, but I had never been nor had I ever heard of it. I realized quickly (after a google search and text chat with my sister and resident HGTV expert) that this town is famous at the moment due to a home renovation series “Home Town” which follows Ben and Erin Napier as they renovate old homes in the area. Erin and Ben have a TV show, a store called Laurel Mercantile and a distinctly southern style it all reflects all centered around this little town. Honestly, at first, I was a little skeptical. I checked out the store online which had a lot branded merchandise like T-shirts and what not, $8 bottles of maple syrup and locally salvaged bricks at $25 apiece. This town is tiny. A quick search and you will find its demographic information spanning from being a town of about seven thousand households with a median income of about 30K a year. Exactly who is out there buying $8 bottles of maple syrup and $26 candles that smell like pancakes on the regular? But this couple along with their TV presence and business has a mission. A mission to revitalize and support small towns nationwide. I’ve lived in a few small towns, Guthrie, Oklahoma probably being the closest in comparison to Laurel (downtown architecture between the two is mildly similar) and their mission is something I can get behind. In the slim 45 minutes between the end of the work day and their 6 pm closing time, we headed out from our campsite into Laurel to check out The City Beautiful and shop Laurel Mercantile or anything else that might be open. Real talk, at that time of day it was a straight-up ghost town, but I’m happy we checked it out. I would love to see what that town is like on a bustling weekday or Saturday. 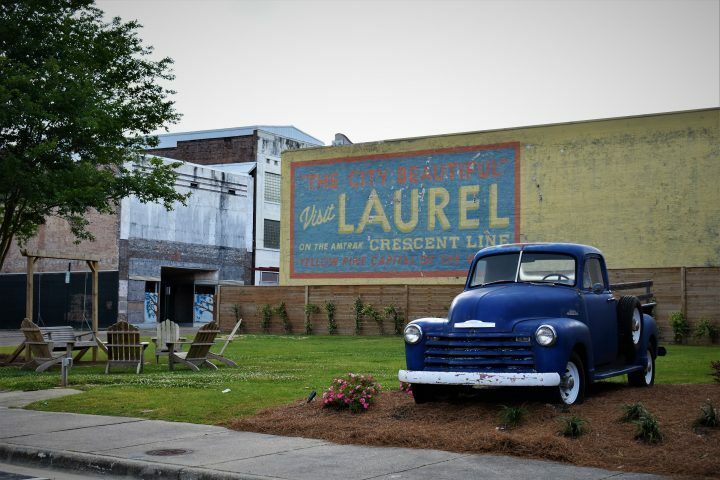 Laurel has that beautiful old town southern charm one would expect to find tucked away in Mississippi, and I am sure that at a busier time of day it probably lives and breathes that charm. Laurel Mercantile is much more than HGTV inspired souvenirs for passing tourists and syrup and candles. It is a welcoming store stocked with high-quality American made goods reminiscent of the comfortably beautiful yet intricate style of the American south. Their wares included vintage quilts, blankets, ceramics, reclaimed furniture, specialty foods and even axes…I didn’t point these out to Ryan; we just no…do not need those at the moment. Southern peach margarita mix? Now, that we do. Their staff was the kindest and incredibly helpful. Hank was absolutely spoiled with the attention he received from the young woman at the cash register, and she enthusiastically shared in his excitement at the passing Amtrak trains while I shopped. They were so wonderful that I regret not asking for a picture, but I’ll forever be such an awkward tourist! Initially, I went in for a vintage quilt which they will repair and refurbish for their purchasing customers, but we’re on the go so I left with a simple and quality Faribault woven cotton blanket that I can’t wait to incorporate into the design of Hank’s bunk. Laurel Mercantile is a store which curates quality, function, design, and comfort; the best qualities of American-made. Whether in-person or online I plan to shop them again. It was a great experience, and it reminded me why I write this blog. My travels aren’t exotic, but they are through America and more often than not the small and quiet towns that genuinely embody the American experience and culture. I’ve traveled from some of the biggest cities in the world to the smallest, and there is just no other experience like the small towns and like Laurel. Laurel lives up to its title “The City Beautiful” because clearly there are passionate and hardworking people who refuse to leave it behind. Those are good people. I love the American experience that you write of and revitalization is always near and dear to my heart. I wish I could be there. Have a happy journey!